The announcement of The Hobbit as trilogy has caused a lot of head-scratching about exactly how such a sequence might play out. Here, guest writer Thomas Monteath goes into detail about how he feels the screenplay might work. These views are his own, and do not necessarily represent those of TheOneRing.net or its staff. Peter Jackson has just announced The Hobbit will become a trilogy, triggering trepidation and enthusiasm in equal measure across the internet. The dissenting voices argue that the novel cannot support three films, and the narrative will thus be ‘stretched’, not unlike proverbial ‘butter spread over too much bread’. I want to make the case here that a Hobbit trilogy should not only work, but could redefine what we think is possible in cinema, and do Tolkien’s world (beyond just his individual books) true justice. We first must realise that the plot and point of The Hobbit, set in its broader context and including Tolkien’s appendices, is as the preliminaries to the War of the Ring – as recounted in Lord of the Rings (LotR). In other words, Sauron (referred to as the ‘Necromancer’ in the Hobbit), and his minions the orcs/ goblins, are the real enemy. Smaug the dragon is but a secondary villain, much as Saruman was the primary villain in the first two Lord of the Rings films but the secondary villain of the LotR trilogy. Remember, according to the appendices, the whole point of Gandalf taking an interest in Thorin’s quest, was his worry that, with Smaug ensconced in the Lonely Mountain, the north was vulnerable to attack, and thus if the Shadow grew again out of Mirkwood, the forces of good would be outflanked from Mordor and the North. In light of this, The Hobbit breaks naturally into three distinct parts, each with its own narrative structure, story and character arcs, each of which can constitute a film without sacrificing anything, and without ‘stretching’ the narrative. The first film, An Unexpected Journey, will not only trace the formation of the Company of Dwarves (including Bilbo and Gandalf), and their whimsically eventful journey across Middle-earth, but also set the scene by unveiling the historical backdrop to not just the Quest, but the whole War of the Ring. Indeed, we know from the trailer that the first film will be set up as a ‘flashback’, with the plot device of old Bilbo writing his memoirs for Frodo at the time of the Birthday Party in the Fellowship of the Ring (FotR): ‘I told you about my adventures, but I may not have told you all of it’. This device allows the narrative of the proposed Hobbit trilogy to potentially include everything up to the time of the LotR trilogy, and even possibly to include events contemporaneous with the end of Return of the King (RotK), such as the Battle of Dale, as in the book while Bilbo begins writing his book in Hobbiton, he tells Gandalf he wants to retire to Rivendell ‘to finish my book’. Gandalf visiting Dol Guldur and finding Thrain, in order to explain how he came upon the key and map. The halcyon days of the Kingdom of Erebor and Dale, to demonstrate what motivates the dwarves to go on the Quest, and what is at stake. Smaug’s subsequent attack on the Lonely Mountain, which brought the Kingdom to an end and sent Thorin into exile, to show what dangers and obstacles lie ahead, if they even get to the mountain. But there will be other flashbacks necessary in the first film, and these will not only extend it beyond the main scene-for-scene narrative of the book, but give dramatic weight and historical depth to the whole Hobbit trilogy, and set up subsequent tensions and story arcs throughout the three films. For instance, to build up the encounter with the Orcs/Goblins under the Misty Mountains, and of course to establish the significance of the Battle of the Five Armies, the antagonistic dwarf-goblin history will also have to be recounted in ‘flashback’. The logical place for this to happen is in Rivendell, following the encounter with the trolls. 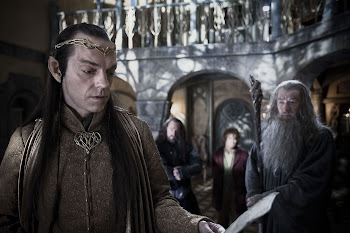 Elrond will undoubtedly enlighten the Company on the origin of the swords they found in the trolls’ hoard. In the book, he explains that they are famous blades that were used against the goblins in previous centuries. Probably using a wide eyed, questioning Bilbo as a device, there will here be historical flashbacks that reveal the depths of the hatred between the Dwarves and the Goblins, culminating in the ancient battle of Azanulbizar, and the role of Azog the Goblin in triggering that war. This historical ‘flashback’ exposition would be perfectly timed to happen in Rivendell, as it ratchets up the dramatic tension as the Company begin their ascent into passes of the Misty Mountains, which results, of course, in their capture by Goblins. Along with everything else that happens, there is thus – when one takes the necessary flashbacks into account – a lot of plot to get through in order to get to the barrel sequence, which appears to be the end of the first film, judging by the recently released panoramic poster. To get from Hobbiton to the barrel sequence (although there is an argument to be made that a better break point is the Company’s internment by the Wood-elves, leaving something of a cliff-hanger, not to mention that the break between films would then allow a sense of Bilbo having spent some time familiarising himself with the Wood-elves palace and locating the Dwarves’ cells, setting up their escape at the beginning of the second film) is a lot of plot if one simply follows the book: trolls; Rivendell; the mountain pass; Goblin Town; riddles in the dark; wargs; eagles; Beorn; Mirkwood; spiders; wood-elves. Bear in mind the first movie will also have to account for Gandalf’s arc once he breaks from the Company at the eaves of Mirkwood. As this happens quite late in the film, he will likely only get so far as meeting with Radagast to the south, travel with him to spy on Dol Guldur, and/ or meet with the White Council. Gandalf’s progress in the first film will probably end with him convincing the Council to assault Dol Guldur, but before the assault actually begins. Thus the first film being titled ‘An Unexpected Journey’: Thorin as an exile trying to band together a disparate group of dwarves on a quest; Gandalf realising what is at stake and convincing the Council of the need for action; and the dramatic heart will be of Bilbo’s journey from Bag End to burglar, and his struggle to gain the respect of the dwarves and to ‘find his courage’. 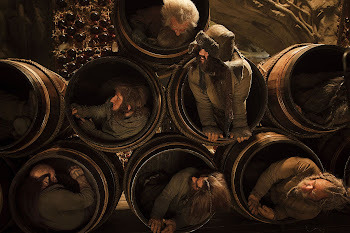 The second film, likely to now be retitled The Desolation of Smaug, could therefore begin with an escape sequence from the Wood-elves via Barrels, and the Dwarves’ arrival in Lake-town. This will involve the introduction of an entirely new culture, much like Rohan in The Two Towers (TTT), and like Rohan, controlled by a corrupted ruler (Theoden was under a spell; the Master of Lake-town is simply corrupt), with a young protagonist who is introduced as an outcast and is rehabilitated and becomes a hero by the end of the film (Eomer in TTT; Bard here). Although the film will then follow the Dwarves on their mission to the mountain via the ruins of Dale – the finding of the door; Bilbo’s interactions with Smaug; the dragon’s scorching of the mountain – the culmination will be the attack on Lake-town and Bard’s killing of the Dragon. Thus the main protagonist – apart from Bilbo of course – will be Bard, and the main dramatic location will be Lake-town, as the film will trace its character at the start – its corruption, and small minded skepticism of the dragon’s existence – to its symbolic cleansing by fire at the end, which represents the vindication of Bard, and his elevation in the eyes of the men of Esgaroth. The second film will also have to include two other story arcs: that of the Dwarves obviously culminates with them emerging from the secret passage into the now empty Kingdom of Erebor, realising that the Dragon is dead, and reclaiming the mountain. It will look like the end of the story, but no doubt this arc will be tempered with signs of foreboding, suggesting that their claim to the mountain may be short lived. The other story arc is that of Gandalf. It is likely that the generally slow-paced scenes for the dwarves and Bilbo in the second film – as they recuperate in Lake-town and plot their advance on the mountain; as they search for the door; and even as Bilbo interacts with Smaug – will be intercut with scenes of the White Council’s assault on Dol Guldur in the South of Mirkwood. It seems plausible that the entire attack and the driving out of Sauron will take place in this second film. By the time this action heavy sequence is being resolved, the Lonely Mountain arc will be picking up speed, with Smaug searching the mountainside and then attacking Lake-town. Thus there is ample scope for a second film that ends with the destruction of the dragon, but that is still rich in narrative and character arcs: Thorin, an arrogant exile in the first film, is a slightly humbled in the second, less forceful but ultimately a better leader for it; Bilbo has blossomed, the de facto leader of the Company; Gandalf has acted on his concerns in the first film, and dealt with the shadow in Mirkwood. 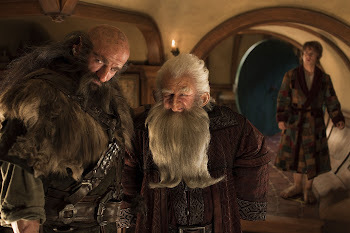 But the film is largely framed by the character arc of Bard for the purposes of the film as a stand alone story, as essentially the characters of Thorin, Bilbo and Gandalf are at the uncontentious apex of their arcs, and none have reached their denouement, which will come in the third film. In short, beginning the film with the arrival in Lake-town and ending it with the destruction of Smaug does not make for a thin film. It could largely stand alone, as Lake-town’s ‘trial by fire’ for it’s sins – corruption and indifference – will carry it dramatically, despite it being the difficult middle act of a trilogy. 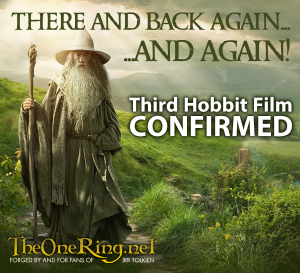 The third film, likely to be given the original title for the second film, There and Back Again, could then begin with the suggestion that some weeks have passed. This allows for four things that otherwise would be hard to show dramatically. The consolidation of Bard’s authority over the refugees of Lake-town. The arrival of the elves, who help Lake-town rebuild, and form an alliance with the men of Esgaroth. The journey of Gandalf north from Dol Guldur to meet with the Elves and men of Esgaroth at the foot of the mountain. The Company of Dwarves settling themselves into the empty halls of Erebor, and the implication that Thorin’s character has begun to change, with traces of avarice, a sense of entitlement (and concomitant lack of empathy for the men of Esgaroth despite their sacrifice) and a delusional belief in the strength of the dwarves’ bargaining position now that they are ensconced in their ancestral halls. The third film will therefore centre on the two main characters, Thorin and Bilbo, reaching their denouement, but via a conflict with each other. Whereas the first film centred on Thorin’s doubt of Bilbo, and the second on Bilbo’s triumph over such doubt, this third could trace how that faith in Bilbo is almost lost through Thorin’s pride before the fall, and its ultimate restoration as Thorin lies on his deathbed, an act that rehabilitates Bilbo and redeems Thorin. Gandalf will also have the resolution of his key interest in the Company’s quest, which is the retaking of the Mountain, and the crushing of the Goblin armies. This is because, as noted, Gandalf’s interest in bringing the Lonely Mountain back under the control of the Dwarves was so that Middle Earth could not be flanked from the North when it came to the final showdown with Sauron. This third film could therefore itself have three acts. First, there is the ‘build up’, the ‘drumbeats of war’: political machinations, failed diplomacy, the massing of the elves and men at the foot of the mountain, the drama of Bilbo’s betrayal, the coming of the dwarves of the Iron Hills. There is then the skirmish between dwarves and the men and elves. But there may also be signs of the Goblins amassing. Indeed, Benedict Cumberbatch, who will voice the Necromancer (i.e. Sauron), has been quoted as saying he has a role to play at the ‘Five Legions War’, which sounds awfully like the Battle of the Five Armies, which suggests that Jackson has made a change where Sauron, in perhaps a diminished form, leads (or at least directs) the goblin/orc/warg armies into battle, and perhaps some attention will be given to how Sauron manages to amass the army for the assault on the Lonely Mountain. The second act is the battle itself, which – as a visual spectacle – will likely dwarf (pardon the pun) the Battle of Pelennor from RotK, for the simple reason of geography: Pelennor was a flat plain, whereas the Battle of the Five Armies occurs in three dimensions, on the sides of a mighty mountain, and thus the fighting will occur over three dimensions, thereby being something utterly different from any other battle in the LotR trilogy. This battle could easily last for easily an hour or more on screen, with so many armies involved, so much ebb and flow: arrival of the Goblins and wargs; the Company bursting from the gates in full armour; Goblins scaling the mountainside to gain the advantage; Beorn’s arrival and his smashing of the Great Goblin; Fili and Kili’s last stand; the arrival of the eagles. And of course, each of the main Dwarf characters will need to have their moment of battle. The third act is the aftermath, which threatens to be a case of ‘many endings’, as in Return of the King: Bilbo discovered on the field of battle; Thorin’s death scene; farewells; Bilbo travelling back via Lake-town (with the skeleton of Smaug lying on the lake-bed, easily the most evocative image in the book); the return journey, via – briefly – the Woodelves; Beorn’s house; Rivendell; and finally Hobbiton. But it is quite likely here that a whole other section could be added, although it is quite possible this may be excised from the cinematic cut. Remember that Old Bilbo appears to be narrating the films, or at least, the Hobbit story is presented as a reflection by Old Bilbo while writing his book in a scene contemporaneous with the beginning of FotR. As he goes on to finish the book in Rivendell, it is therefore possible to write into the story some events that pertain to events in the LotR trilogy, and in doing so ‘link up’ the two trilogies more explicitly. Thus The Hobbit trilogy could well end with Bilbo closing his book, and handing it to Frodo in Rivendell, on Frodo’s journey back to Hobbiton following the trip to Mount Doom in RotK. Gollum leaving the misty mountains after some years, and making his way to Mordor, where he is captured by Sauron and tortured. This ultimately leads to the Dark Riders seeking the Shire, as shown in FotR. Given that it is possible that Old Bilbo could be concluding his narration in Rivendell, and after the ring has been cast into Mount Doom, Gollum could also be shown, following his escape from/ release by Sauron, trying to find a way across the Misty Mountains to find the Ring, and coming across Balin’s company as they attempt to reenter and re-colonise Moria. To cleverly link up narratives, Gollum might even be presented as a witness to the death of Balin in Dimrill Dale, an act that precipitates the destruction of the colony by the orcs who invade Moria. This would do two things: explain how Balin’s colony in Moria was laid waste and Balin given his tomb; explain how Gollum came to be in Moria, which is where he first appears in FotR tracking the fellowship. (In the book, Gollum begins tracking the fellowship in Moria as the gates by which they enter do not open from the inside, and thus that is as far as he could go when he crossed through Moria in search of ‘Baggins’. He had been skulking there, alone in the dark of the eastern end of Moria, for some unspecified time by the time Gandalf opened the doors by saying the elvish for ‘friend’). A narration of the ‘war in the north’ – the battle of Dale, which Tolkien mentions in the appendices. This battle happened in the north at the same time as the Battle of Pelennor in RotK. Giving details of this battle is relevant to the story, as of course Gandalf took an interest in Thorin’s quest in the first place because he wanted to buttress the North against future attack. Showing the Battle of Dale would demonstrate how Gandalf’s quest was not in vain, and also provide a link to the trilogy. 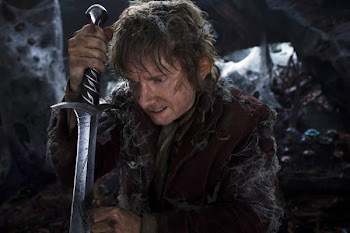 It is also possible to show this, as Old Bilbo is narrating The Hobbit, and thus he could be writing the battle of Dale, and narrating it, as a sort of coda, to ensure that the conclusion of The Hobbit trilogy does not just dovetail with the beginning of the FotR, but also aligns with the conclusion of RotK. It is worth noting that Peter Jackson has said there ‘is a lot of stuff in the appendices they want to put in the films’, but if one looks at the appendices, the most filmable bits are the historical battle of Azanulbizar and the RotK-era Battle of Dale. 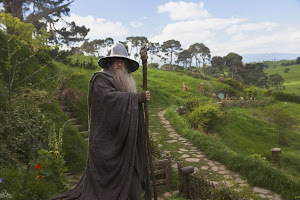 By this reckoning, which I believe to be consistent with everything we know about these films, the director, the scriptwriting team and Tolkien’s source material itself, Jackson’s proposal of a Hobbit trilogy makes perfect sense, but only when we see it as part of a broader project to do Tolkien’s world more justice. In light of them trying to do Tolkien’s world more justice, I also suspect the filmmakers might well take the opportunity to film some scenes that use sets and actors available during the filming of the Hobbit that can be integrated into a ‘super extended edition’ of FotR in the future. Gollum’s tracking and interrogation by Gandalf, including his internment with the Wood-elves (For practical reasons, Aragorn’s role in his capture could be left out entirely without affecting the narrative, although his inclusion – perhaps just as a cameo – would no doubt please Tolkien aficionados). This would be possible due to the availability of the Wood-elves set. This flashback could be integrated with great success into the scene in FotR where Gandalf briefs Frodo in the Shire about the nature of the ring and the gravity of the threat. This scene, as it currently exists in FotR, is easily the weakest link in that film, because given that it is the scene that sets Frodo on the quest, it was far too tightly edited, and his departure from Hobbiton thus seems almost hasty and impetuous. Indeed, the Gollum section from FotR prologue could be moved to this scene, and integrated into this flashback sequence. 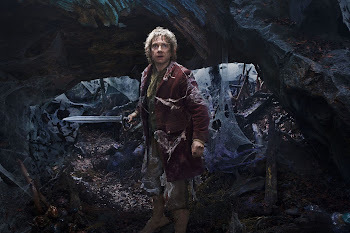 (it is also worth noting that, given the suggestion above about a flashback in the third Hobbit movie showing how Gollum came to be in Moria, in a future edition of FotR Jackson will likely also re-jig the CGI for Gollum in Moria, and perhaps even add a few glimpses of him tracking the fellowship from the shadows before Frodo notices him. 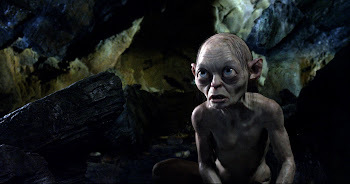 Giving Gollum a slightly less distant introduction in FotR must be almost obligatory now the Hobbit has been filmed, as if the six films are watched sequentially he is an established character by FotR, and would have to be given a more nuanced treatment with his reintroduction in Moria). What is more, the rest of the prologue from FotR, which lays out the history of the ring, could be moved to its proper place as it is in the book, which is Gandalf’s explanation at Bag End to Frodo about the nature of the One Ring, once he extracts it from the fire and sees the markings. It would be possible to extend and film new dialogue for the discussion between Frodo and Gandalf in Bagend as both actors have reprised their roles in the Hobbit, and the Bag End set is also available. This restructuring would allow FotR to pick up precisely from where The Hobbit trilogy left off, in that the Hobbit trilogy would both begin and end with ‘Old Bilbo’ narrating while writing in his book before Bilbo’s Birthday Party, and FotR would then begin – as it does straight after the prologue in the Extended Edition – with Bilbo in the same scene, narrating about Hobbits. The backstory for Gimli, to be integrated into the overly-truncated Council of Elrond in FotR. The ‘flashback’ they could film during the filming of The Hobbit would be of an agent of Mordor coming to the Lonely Mountain seeking ‘Baggins’, which causes Gimli to later be sent to Rivendell for the Council of Elrond to seek advice (Gimli is undoubtedly in the films, as Rhys Davies has virtually admitted as much and has been filmed on set ‘visiting’ the cast). It is quite possible Jackson is taking advantage of availability of Rhys Davies, the Rivendell set and the new Erebor set to film this scene, the latter of which was not available when they filmed FotR. The backstory for Legolas, to also be integrated into the Council of Elrond. This could include Gollum’s escape from the Wood-elves. Filming such a flashback is possible due to the availability of Orlando Bloom and the Woodelves set during filming of the Hobbit, the set of course not having been available when they filmed FotR. In filming a Hobbit trilogy, I would therefore argue that Peter Jackson, Fran Walsh and Philippa Boyens are not just doing a ‘prequel’ in the traditional sense, with the end of the prequel narrative dovetailing with FotR. What they appear to be doing is fleshing out the whole LotR world, partly by giving crucial background in a dramatic fashion by doing the story in the Hobbit book, but also by fleshing out the wider world of LotR beyond the character arcs of the nine members of the fellowship, which was the key focus of the original trilogy. If this is what they are planning, it would be unprecedented in film: rendering a world through trilogies that are not just sequential so much as also complementary and parallel. These will be 3D films not just visually, but in terms of the narrative too: both trilogies are an angle on the same world. If you watch them both, each presented from the angle of different protagonists and story-lines, you end up in your head with a ‘3D’ picture of a whole world. Which is what Tolkien created: a world that is almost real in its detail, layers, complexities, and wholeness. I think this is what, in proposing a Hobbit trilogy, they are trying to achieve, and the device of Old Bilbo as narrator allows them to span the story from as far back as the battle of Azanulbizar to as far forward as the Battle of Dale. The crucial point is to get away from thinking that the primary villain of the Hobbit is Smaug. He is the main antagonist in the second film, and the main focus for the Dwarves themselves in the context of the Quest throughout films one and two. But from the broader perspective of Gandalf, Bilbo and the broader sweep of Middle-earth, the main antagonist of the Hobbit trilogy is actually Sauron, who emerges – through the proxy of the Orc host at the Battle of the Five Armies – as the primary villain in film three, not to mention a feature of films one and two as well. In other words, Smaug is to a Hobbit trilogy as Saruman was to the Lord of the Rings trilogy: the main antagonist of films one and two, but the secondary villain of the wider trilogy. Saruman in the LotR trilogy was a secondary villain who, through his own vanity and attendant schemes, could nevertheless scupper the hopes of the free peoples of Middle-earth; Smaug in The Hobbit trilogy is a secondary villain who, through his own greed and avarice, could also scupper the hopes of the free people of Middle-earth. In other words, the story structures of the LotR and this likely Hobbit trilogy are almost identical, with similar character arcs, similar story beats, and similar secondary antagonists (and the same primary antagonist). The Hobbit is ultimately about ‘setting the board’ for LotR, in which, to quote Gandalf himself, ‘the pieces are moving’. The Hobbit begins the story arc of Hobbits and the Ring, and the six films together form the third act of Middle-earth, with acts one and two being first and second age – ‘ancient history and a long story’ – and not subject to film beyond a few flashback sequences, largely confined to the FotR prologue. In terms of the cinematic experience, The Hobbit trilogy is therefore likely to be funnier, more richly textured and adventurous, and with a little more time to develop characters than LotR. In short, and before you even take into account the better special effects, larger budget, greater creative freedom, 48fps and 3D, this trilogy looks like being significantly more entertaining and faithful than the previous trilogy. And how many Oscars did that win? 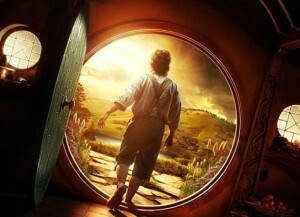 Far from disparaging the idea of a Hobbit trilogy, we should be salivating at the prospect. Thomas Monteath is a life-long Tolkien aficionado, who still believes – with apologies to the excellent Andy Serkis – that the finest Gollum was Peter Woodthorpe in the BBC’s 1981 Radio adaptation. In real life he an academic in the UK, who can on occasion be found propping up the bar at the Eagle & Child. He can be contacted at thomasmonteath@gmail.com. His views are his own, and do not necessarily represent those of TheOneRing.net or it’s staff.